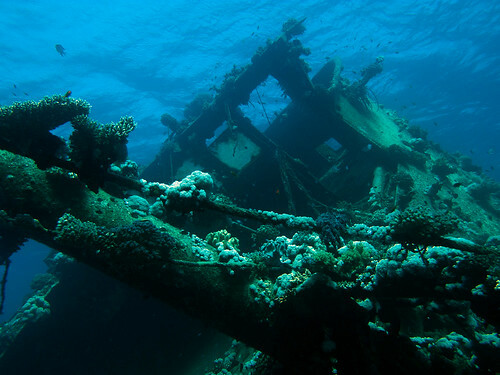 The Red Sea reefs around Marsa Alam are among the world's most fascinating for shipwrecks. With the opening of the Suez canal in 1869 it became the prime route for shipping between Europe and Asia and the numerous reefs and shoals were a deadly danger sinking an unknown number of vessels. Nature quickly colonized the wrecks and they became the home to a colourful diversity of fish and coral species. Those in shallower waters provide an amazingly photogenic and challenging environment for divers. But if you are going to explore a wreck do listen to the advice of your diving guide to ensure you have a fascinating but safe dive. 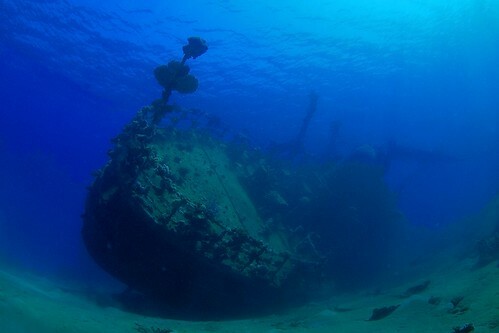 Here are what I think are the top five shipwrecks within 100 miles of Marsa Alam. Number 5 and 4 (the first two listed) are only suitable for advanced divers. What: British cargo ship, 6399 tons, 140 metres (460 Feet) owned by the Anchor Line Shipping Co.
Where: On Big Brother Island north of the lighthouse approximately 59km ENE of El Quseir. When: Launched 1901 and ran aground 20 July 1901 during her second voyage bound for Calcutta. Who: 97 crew under the command of Captain John Craig - all survived. Why: Navigational error by the Second Officer of the ship after the Master had left the bridge. Depth of Wreck: 9m to 72m. Any unsalvaged cargo ? Iron locomotive rails. Hazards: Strong currents and beware diving too deep. Vulnerable to adverse weather conditions. Common Marine species: Grey reef and hammerhead sharks as well as lionfish, gorgonians, antipitharians, sea whips and many varieties of soft coral. Skill level required: Only for experienced divers. Visibility: Average 20m (65 ft) - wreck lies in shade in the morning - colours better in the afternoon. Did you know ? The island's stone lighthouse is 32 metres high and was built in the nineteenth century. Note: As this wreck is in a protected marine park please ensure you have the necessary permission. Why dive here ? Due to its' remote location and challenging dive, you will be one of only a few to visit. What - Egyptian supply ship originally launched in France in 1911. 1428 tons and 75 metres long. Where - On Big Brother Island approximately 59km ENE of El Quseir. 220m north of the lighthouse and jetty. Approx GPS 26 18.25" N, 34 51.43"E (not accurate). When - Sank on 15 September 1957 while bringing lighthouse staff to the island's jetty. Why - Adverse weather caused the ship to strike the rocks as she attempted to unload. Who - The Captain and 76 other personnel were all rescued by a tugboat. Depth of wreck - 28 to 52 metres. Angle of Incline: Around 40 to 45 degrees (very steep) - it seems to defy the forces of gravity. Hazards: Depth of wreck, exposed location in adverse weather and strong currents. Wreck condition: Its' steel framework is largely intact except damage to the bow section. Wooden sections have rotted away. Common marine species: Large anemones, groupers, glassy sweepers and clownfish. Soft coral in orange, purple, red and other vibrant colours. Grey reef and hammerhead sharks often nearby. Skill level required - due to the depth, incline and currents this is definitely for advanced level divers. Why dive here ? Seldom visited, unspoiled and largely intact wreck, rich in marine life. What: Zambezi class British destroyer, 1930 tons and 111 metres long, launched in 1943, completed in 1944 and subsequently sold to the Egyptian navy in August 1956. She bristled with weapons including four 119mm guns, six anti-aircraft guns, torpedoes and 70 depth charges and was capable of an impressive 36 knots. Why: While at anchor just off shore she was the victim of a massive surprise air assault by Israeli Dassault Mirage aircraft (according to one account) or 12 Israeli F4 Phantoms (according to another account). Although she fought back and withstood several attacks, she eventually succumbed to overwhelming firepower. Her structure ripped open by cannon fire and missile strikes, and her deck ablaze she stood little chance, her bow ripped open by the adjacent coral reef as she sank. Who: Originally the ship would have had a crew of around 200 but it's not known how many were on the ship when it was attacked or how many casualties there were. Depth of wreck: Above surface to 21 metres maximum depth. Any unsalvaged cargo ? Spent cartridge cases from the anti-aircraft guns used during the short but desperate fight with the Israeli Mirage aircraft. They now litter an area of the reef close to the wreck. At least one and probably numerous 4.5 inch armed shells. There is one still in the breech of the stern gun. Other unused ordinance lies neatly on the top of one of the Bofors AA guns. However the RU ammo lockers are reportedly empty. But don't remove anything ! - it would be an illegal theft and also an insult to the dead. During my research I discovered several items from the ship either recently sold or still for sale though I'm not suggesting that these were taken or sold illegally. Hazards: Don't touch any live ammunition - take the usual precautions for diving at a wreck. Wreck condition: - Despite the immense damage inflicted by the aerial assault, the wreck is in surprisingly good condition with the bow section still held in place by the ship's anchor. As the bow of the wreck is jammed on a rocky reef, it is possible to swim under the aft section which still remains perched several metres above the seabed. Caught offguard in the attack, the ship's internal watertight doors are still open and it is possible to swim through large sections of the wreck although as always great care should be taken. Common marine species: Giant groupers, sponges and soft corals of vibrant colours - some attached to the ship's giant propellers at 21 metres. The entire wreck has become a haven for numerous species of fish and you may well see Jacks, Napoleons, giant Puffer Fish, dense shoals of Silversides and an occasional solitary barracuda. Skill level: Intermediate (with suitable supervision and guidance) or advanced. Note well: As this wreck is not far from an Egyptian naval base please ensure you have all the necessary permissions and paperwork for the dive. What: A british merchant ship designed to carry fuel and machinery. Built in 1912 for the Anglo Saxon Petroleum Company, she displaced 4,900 tons and was 374 feet long. Where: The stern section lies 24km (15 miles) north of Ras Banas and approximately 85km south of Marsa Alam and only a short distance from the shoreline. When: the ship broke in two on 4 April 1943 and the bow and stern sections sank separately the following day. "The pump room and number three, four and five holds were flooded, the deck was buckled on the starboard side between 3 and 4 tanks and there was a large hole in the ship's side some 40 feet fore and aft". The damage was so extensive that she could not be repaired so it was decided to tow her out to Karachi for use as a fuel storage hulk. However she broke up 24km (15m) north of Ras Banas. The bow section was sunk by gunfire as it had become a menace to shipping while the stern section foundered off the reef. Who: As the ship was empty and was being towed to be used as a storage tank in Karachi, it's unlikely there were many on board when she foundered. There are no reports of any casualties. Depth of wreck: The vessel lies on its' side with its' starboard flank about 18 metres below the surface while its' port side rests on a sandy bed some 28 metres deep and close to the reef face. Any unsalvaged cargo/items ? Apparently a surprising amount given that this ship was on its' final voyage. This includes various equipment in the workshop including a lathe, oil cans and even a watering can. Wreck condition: Given that this ship was torpedoed and subsequently broke up and that the wreck is only the stern section, what remains is surprisingly intact. It's possible with care to explore the huge engine room and to swim around three floors. Many of the handrails, gauges and valves are still intact. 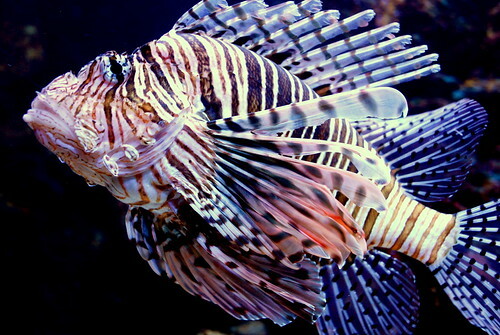 Common marine species: Lionfish, Pixie Hawkfish, sponges and lots of colourful coral. Visibility: Not so good due to the sandy bottom. Skill level required: Intermediate (with proper guidance and care) or advanced. Perhaps not as difficult as some deeper wrecks but still demands great care - please consult with your diving guide. What: A coastal cargo vessel of 500 tons launched in 1965 with a length of 65 metres and draught of 4 metres. She was originally built for a subsidiary company of P&O but subsequently was sold on repeatedly to various Cypriot owners and finally in 1986 to a Maltese registered company. Where: The wreck lies approximately 68km SSE of Marsa Alam, south of the Wadi El Gamal Nationa Park entrance and approximately half a mile south of the phosphate terminal at Abu Ghoson (sometimes spelled Abu Ghusun or Abu Gosoon) at approximate GPS location 24.42N and 35.25E. When: On 28 June 1993. The vessel had left the port of Jeddah in Saudi Arabia and was enroute for Suez. Why: It depends which report you believe. One states the vessel caught fire and another that she struck a reef in bad weather. However divers have discovered a charred matress which suggests that fire was the most likely cause. Depth of Wreck: 0 to 18 metres. The port side of the ship protrudes just above the water line at low tide. Parts of the wreck are so shallow that you can snorkel them ! Any unsalvaged cargo/items ? Almost everything on the ship had to be abandoned and now items ranging in size from telephones to a fork lift truck have become surprising homes for many types of marine life. Bags of polythene granules, a Saudi petro-chemical export, can still be seen in the cargo hold. Wreck condition: The vessel lies on its' starboard side in two sections. Suitably qualified divers may be able to swim into parts of the wreck including the pilothouse, engine room and cargo hold. The most impressive and relatively intact features include the bridge, the rudder and stern propeller. Common marine species: The wreck has attracted many types of coral and marine life including Napoleons, Lionfish, Parrotfish, Surgeon fish, Butterflyfish and Moray eel. Skill level: Suitable for all diving levels providing suitable precautions taken and a guide present. Why dive here ? It's a bewitching dive site and a beautiful reminder of the delicate harmony and balance between man and nature. Looking for a diving course or trip ? Steven is a top local expert with knowledge of all the major Red Sea diving sites - email steven@marsaalam.com or telephone Steven on +20 1010 45454 98. He offers courses and trips running from the Mirage Moon Resort, just 2km north of the small town and anchorage of Marsa Alam and 68km south of the airport. This is one of the best locations as it boasts one of the area's only natural lagoons and it is close to some of the best dive sites. This is because being further south than most it is nearer to the Red Sea's least explored and still virgin reefs. Steven offers scuba diving courses, guided scuba dives, snorkeling, kitesurfing and windsurfing - all starting from the same location. If you are looking for an overall package you can't do better than his unbeatable offer, valid throughout 2013, of seven nights all inclusive at the Mirage Moon Resort plus ten dives for just 450 euro per person. And if you think that's an amazing offer, Steven is also including a free return Luxor excursion ( see our excursions page for more information ) and a free taxi return pick-up from Marsa Alam airport to any local hotel. 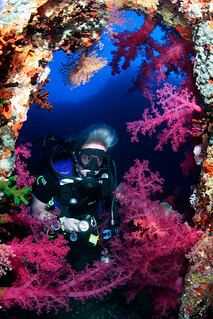 His scuba diving courses are all with multilingual instructors and include PADI, SSI or NRC. The most popular open water course takes four full days, including at least four pool dives and four open water dives and is priced at just 350 euro plus 30 euro for the certificate card. This course also includes the same unbeatable offer of a free day excursion to Luxor and a free taxi return pick-up from the airport to any local hotel. Steven also offers more advanced courses and for those already qualified there are the options of a six dives package at 156 euro, an eight dives package at 210 euro or a ten dives package at 252 euro. Couples and families can share any of these. Early morning and night dives have a ten euro charge supplement. If you haven't brought your own diving equipment, the rent for full diving equipment is charged at 25 euro per day or you can also rent individual items of equipment - for details please see the table in the right hand column opposite. A postcard of the Allan Line Royal Mail Steamer "Numidian" which sank off Big Brother Island. Divers explore the engine room of the SS Numidian. August 2012 - 2.47 minutes. Diving down to the wreck of the SS Numidian. November 2011 - 4.03 minutes. The bow gun of Al Qaher still points skyward in this great wreck photo by "gh0stdot" on Flickr. was transferred to the Egyptian navy. September 2007 - 5.12 minutes - over 4000 views. Video of the SS Turbo showing the coral and sea life now inhabiting the wreck - March 2010 - 5.55 minutes. A photo of the SS Turbo of unknown date. An S79 Sparviero drops its' torpedo - in a similar attack to that endured by the SS Turbo. Date 1942 or 1943. A photo of a lionfish by Iceman9294 on Flickr. 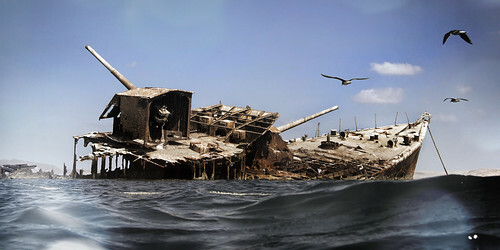 This breathtaking photo of the Hamada shipwreck, taken in March 2010, by Fred Panza - posted on Flickr. Youtube - April 2009 - 15.22 minutes. Youtube - August 2015 - 3 minutes. Another Youtube video of a Hamada shipwreck dive. September 2016 - 2.36 minutes.